The BR class 22 type of diesel hydraulic locomotives was confined to the Western Region but MIAC has been unable to locate any photographs of the class actually in use in Worcestershire. The 58 locomotives of class 22 were built by North British from 1959 onwards and fitted with NBL or MAN engines and Voith-NBL transmissions. They were of the mixed duty 'type 2' classification. And another class member running light - southbound - at Spetchley, the number escapes him but presumably got at least as far north as Bromsgrove. "On the 23rd of the month (December 1967), passengers on the 13.15 Paddington-Worcester suffer a frustrating time when their locomotive, Warship, 842 Royal Oak fails just outside the capital and is replaced by Class 47 locomotive No.1664 'George Jackson Churchward'. The 47 works as far as Oxford where the machine meets the same fate as the Warship. The service eventually reached its destination behind Class 22 No. 6336." The MIAC has no independent confirmation of this information but if accurate would probably be the first and only time a Class 22 locomotive was used on a passenger train in Worcestershire. This note also provides a perfect excuse for a photograph of the nameplate of No.D1664 taken by Andrew Smith at Gloucester in 1973. A photograph of D842 appears here. Keith Riley made observations of class 22 locomotives at Worcester during the period from August 1969 to June 1970 and noted four examples during this period. He twice saw D6310 and D6320 arriving from the south doubling heading ballast trains, the date is unrecorded but Keith thinks probably in Autumn 1969. Both locomotives were in green livery with small yellow panels and might well have come from the Gloucester area. Keith also saw D6348 (possibly green livery) and on another instance D6354 in blue livery although he is unable to remember on what duties were being operated by these locomotives. After withdrawal a few examples made their way to Worcester for storage. 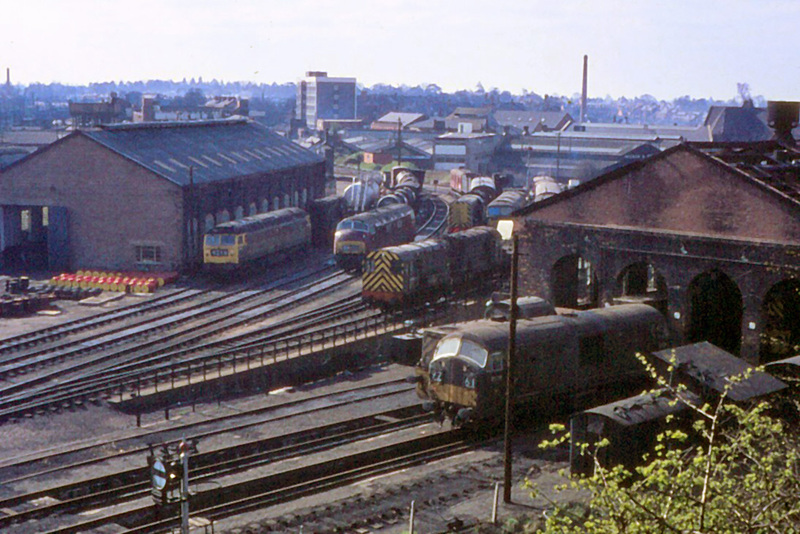 This interesting photograph of the sheds at Worcester was taken by Pete Wilcox on 12th April 1968 from 'Railway Walk'. The new diesel shed is on the left hand side with a class 47 diesel locomotive and a class 08 diesel shunter alongside. Also on the lines between the two sheds are a red livery class 43 'Warship' diesel hydraulic locomotive, three more class 08 diesel shunters, a class 35 diesel hydraulic locomotive and a pair of tenders formerly fitted to 'Castle' class steam locomotives. The main items of interest are on the right hand side which shows the former 'Washout' shed in use for the storage of surplus locomotives. The nearside of the four lines has been taken up although the sleepers remain insitu. Outside the shed are class 22 diesel locomotive No.D6316 (the first of this class to arrive for storage) with a class 14 diesel hydraulic locomotive alongside. A further two class 14s are in visible in the shed which appears to be in the process of losing its roof. Issue No.2 of the Worcester Locomotive Society magazine 'The Big Four' records that, on 5th January 1961, No.D6335 was hauled through Worcester by 'Manor' class 4-6-0 steam Locomotive No.7806 'Cockington Manor'. The diesel locomotive was assumed to be en-route to the North British Locomotive Co Ltd's works in Glasgow.